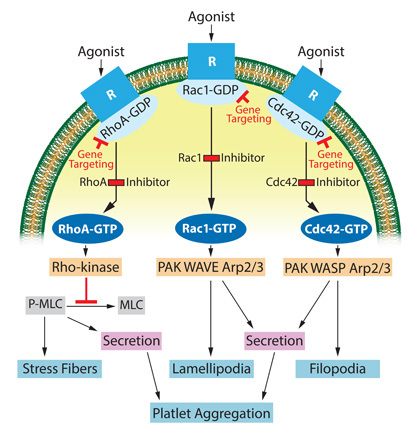 Roles of Rho GTPases, Rac1, Cdc42 and RhoA in regulation of platelet activation. Taken from: Huzoor Akbar. Antithrombotic Drugs and Their Complications. In Pathobiology of Human Disease, Publisher: Elsevier, Editors: Linda M. McManus, Richard N. Mitchell, pp.1613-1627 (2014).